Home→Amish→Can an Outsider Ever Truly Become Amish? Amish conversion is extremely uncommon, which makes sense: who actually wants to give up modern convenience for more than a week or so? For those who have made the leap, the lived experience of conversion deviates greatly from the fantasies moving across web pages every day; it’s harder, crueler, slower than the hopeful could imagine. 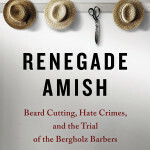 It’s also not a static state–for most converts, the emergence of a perfect Amish self never truly occurs.